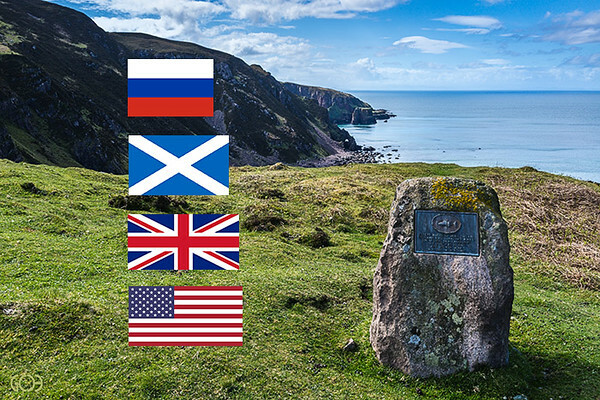 In the NW Highlands of Scotland there is a trail along a rugged and beautiful coast which, after my first walk along it, I have always thought of as the memorial trail. The area where this trail exists is rich in history and legend and as you follow the trail you will encounter various memorials. 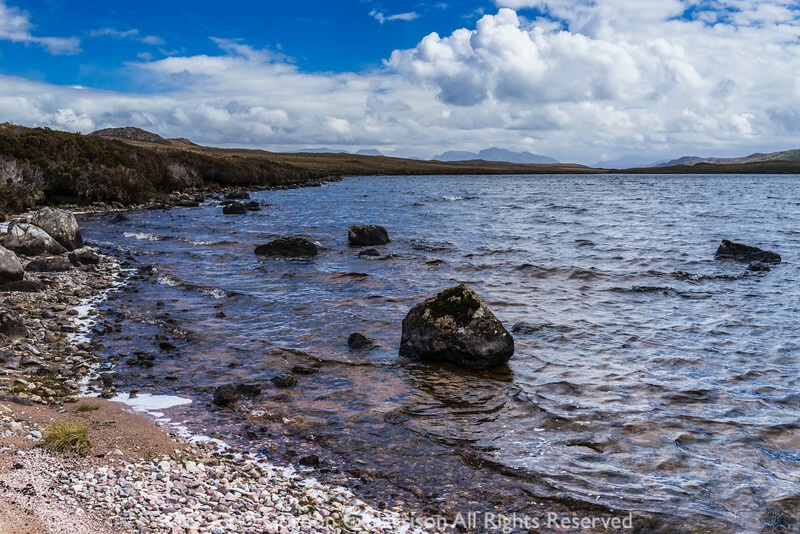 To explore this trail you must first head to Loch Ewe, a deep sea loch on Scotland's north-west coast, then, taking the road from the village of Poolewe at the southern end of the loch, drive north along the single track road that wends its way along the western shore of Loch Ewe. 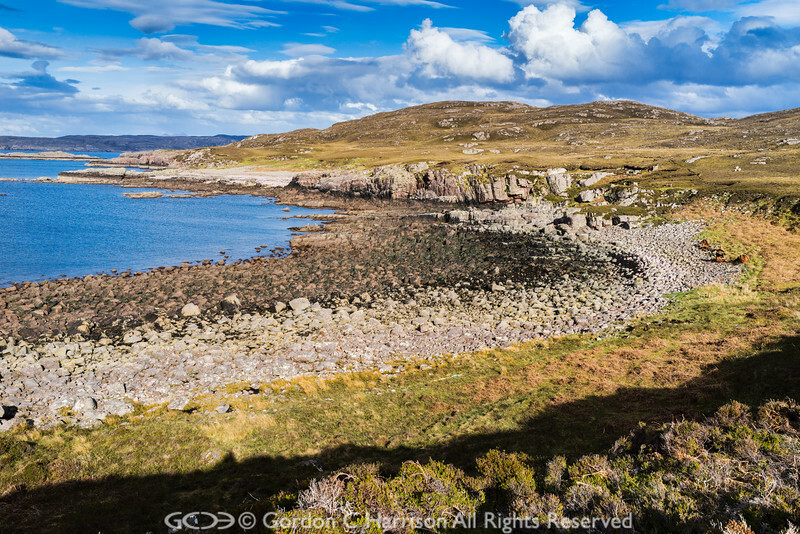 The photo below shows the scene that greets you as you near the end of Loch Ewe and the beginning of The Minch, a strait separating the NW Highlands from the Hebridean Islands. The village in the photo is the crofting township of Cove situated by Camas Dubh. Note that to view this photograph in a larger size, or any of the subsequent photographs in this blog (except the map), just click on them to view them in the gallery. In the gallery you can click on them again to view them at the maximum display size available on your viewing device. Drive on through the village of Cove until you you reach the end of the road, here you can drive into a rough piece of ground set aside for car parking. The memorial trail starts here and the route of the trail is shown on the map below. This easternmost point of the peninsula (see 1 on the map below), known as Rubha nan Sasan, is where the trail starts. For maps of this area use either the OS Landranger 1:50,000 map (no. 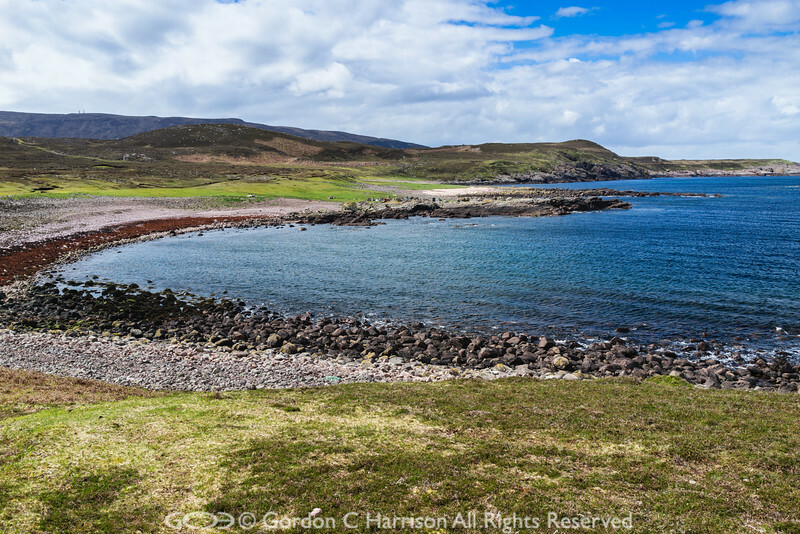 19), Gairloch and Ullapool or, for more detail the OS Explorer 1:25,000 map (no. 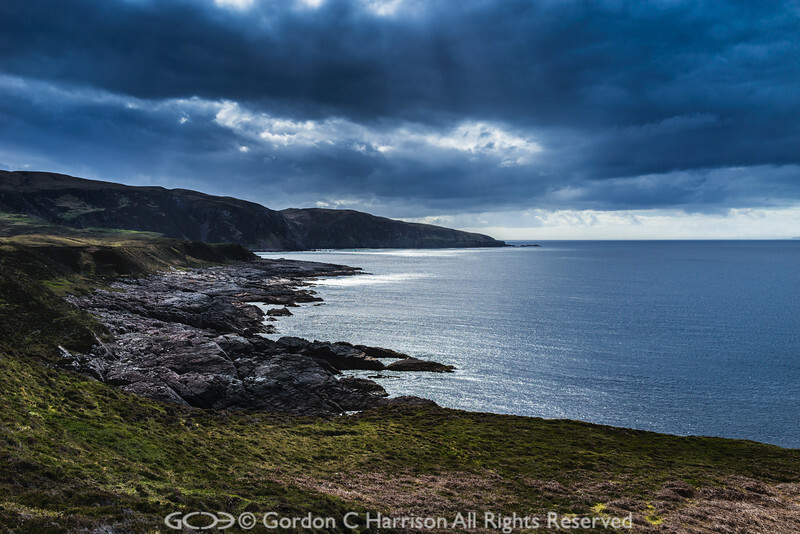 434) Gairloch & Loch Ewe. The red line on the above map shows the route of the trail. It is about 16 kilometres in total with tracks to follow much of the way but in some places the tracks do disappear. However, as most of this route is coastal there is not much doubt about where to go. You may end up walking more than 16km as there are so many nooks and crannies along this coast that just cry out for exploration! Give yourself a leisurely day to do this. In places it can be boggy, particularly after heavy rain, so ensure you are properly dressed for the conditions and have protective clothing for the worst the weather could throw at you. 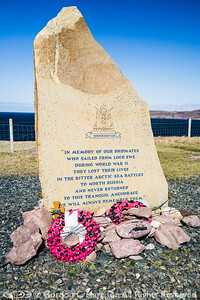 During WWII Loch Ewe was used as the base from which many of the Arctic Convoys began their perilous journey to the northern Russian ports of Murmansk and Archangel. The convoys, known as 'Suicide Missions' by many of those who sailed in them, were vital to Russia. Russia was blockaded by Germany so the Arctic ports were were the only viable way of providing them with military equipment and munitions. Over 3000 men died in the freezing North Atlantic waters as a result of the convoys being attacked by German u-boats and aircraft. 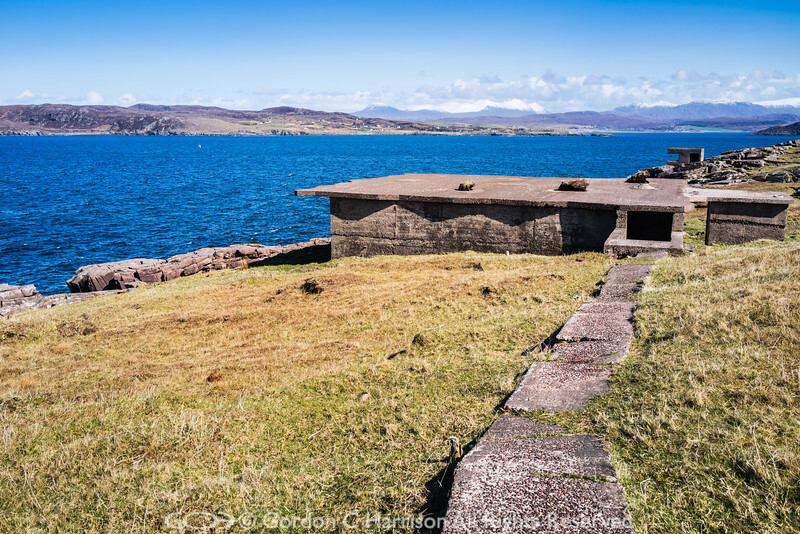 Loch Ewe itself was well protected by guns throughout its coast line. In addition a boom defence net was placed across the mouth of the loch to prevent German u-boats from getting into the loch and attacking the convoy ships. However as the sailors sailed out from Loch Ewe on their convoys they knew they were leaving their well protected loch base behind and venturing out into extreme danger from which they might never return. 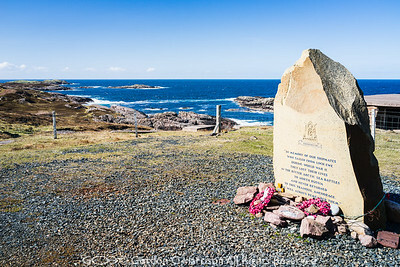 Illustrated below are two photographs of the Sasan Memorial stone erected at Rubha nan Sasan to all those who lost their lives in what was called by Prime Minister Winston Churchill "The Worst Journey in the World". Scattered on the hillside at Rubha nan Sasan all around the memorial are various WWII structures used as lookout posts, gun emplacements, service buildings and stores. Some of these are shown below in a view looking south-east down Loch Ewe towards the mountains of the Great Wilderness. 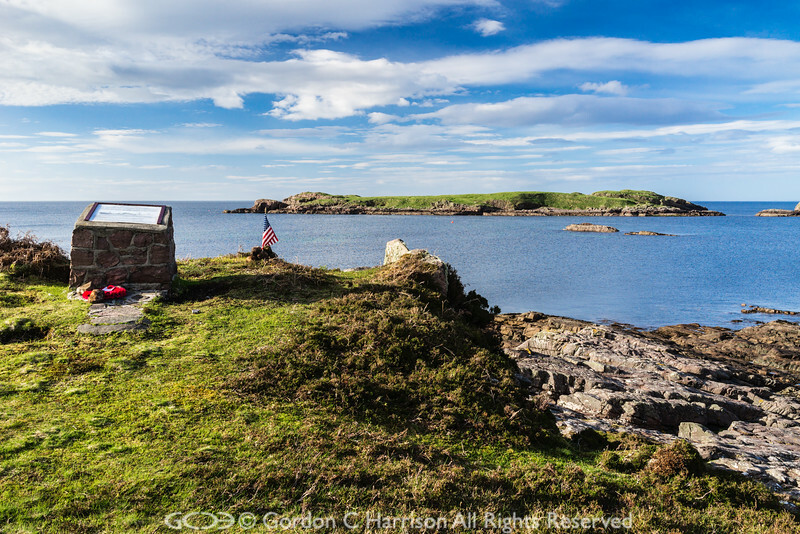 The photo immediately above shows the coast line you walk along once you are finished exploring the WWII artifacts at Rubha nan Sasan. The easiest access to this coastal walk is to return to the car park, go to the end of it and start your coastal walk from there. This will eventually bring you to the next memorial at which is situated Camas an Aiseig (means Ferry Bay in English, see 2 on the map above). Just offshore from the memorial lies the island of Eilean Furadh Mor. 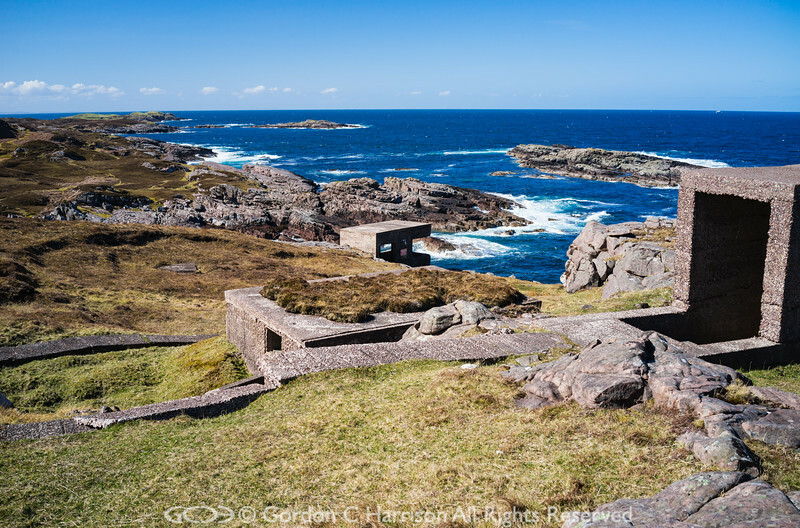 At 4:20 am on February 26, 1944 the American Liberty ship USS William H Welch was making its way to Loch Ewe to join a convoy when it struck rocks at the western (left in the above photo) end of the island. The weather conditions were appalling with full gale force winds, heavy snow falling and 50 foot waves. It was impossible to use the life boats in these conditions. Although the engine room was immediately ordered to full astern it was to no avail. The ship was stuck fast, the engine room was filling with water and over the next two hours the pounding of the waves became an intolerable strain upon the hull. By 6am the ship broke in two. Daylight brought rescue attempts from a British tug attempting to get lines on board. The attempts were unsuccessful. As the ship continued to settle the waves came higher over the ship. At 10:45 am the crew were still all on the flying bridge but 30 minutes later large waves crashed over the bridge, destroying the wheelhouse and washing the crew into the sea. Of the crew of 74 only 12 were saved despite heroic efforts to rescue them by both the local military resources and the unstinting help of the local people in what were truly appalling conditions. Many of the bodies were never found. There is a book by Steve Chadwick entitled 'The Wreck of the William H Welch' which has an an extensive account of the tragedy. There are also several accounts on-line which provide a details of the rescue efforts by all concerned. Some of the crew were washed ashore at the bay opposite the island as were the unused lifeboats. In fact the rusting lifeboats still lie on this shore to this day. In all the accounts I have read of this tragedy the bay where the men and lifeboats were washed ashore is referred to as Black Bay. Current Ordnance Survey maps for this area do not name this bay or even the next bay to the west. However the Six Inch OS map of 1888-1913 which is available at the National Library of Scotland does name the bays along this coast. 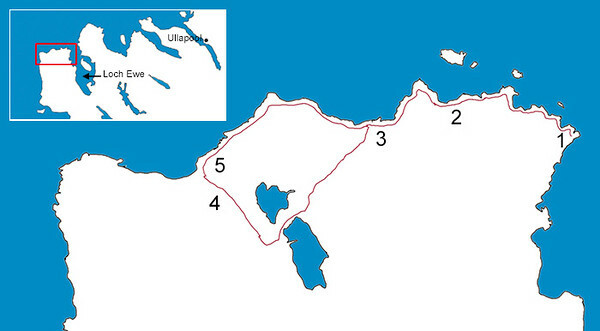 You can click the above link to view this map. That map shows that the bay opposite the island is actually called Camas an Aiseig - this means Ferry Bay. The map also shows that the next bay to the west is called Camas Dubh, that is Black Bay. Furthermore a map published in 1857 by the Hydrographic Office confirms that it is the bay to the west of where the tragedy unfolded that is called Black Bay. Somehow, by the time of WWII, the original names of the bays have become confused and Camus an Aiseig, where the tragedy actually occurred has been wrongly called Black Bay. I am of course assuming that the maps at the National Library of Scotland are correct. I imagine that since it is called Ferry Bay that there must have been a ferry here at one time. Perhaps the island just offshore, Eilean Furadh Mor, was used as summer grazing for sheep and a ferry would have been used to take sheep to and from the island. There is a comment box at the end of this article and I would be glad to hear from anyone who can add any knowledge of the place names of this area or can explain why the accounts of the sinking of USS William H Welch refer to the bay where the men were washed ashore as Black Bay when the six inch OS map at the National Library of Scotland refers to the bay as Camas an Aiseig. The above image shows the inscription on the memorial stone for the USS William H Welch. Depending on your viewing device you may be able to read the inscription. If not click on the image to view it in the gallery, then click on it again to view it at its largest size. In the view of Camus an Aiseig above can be seen the rusting remains of the lifeboats from the USS William H Welch. They are lying at the far right of the photo. 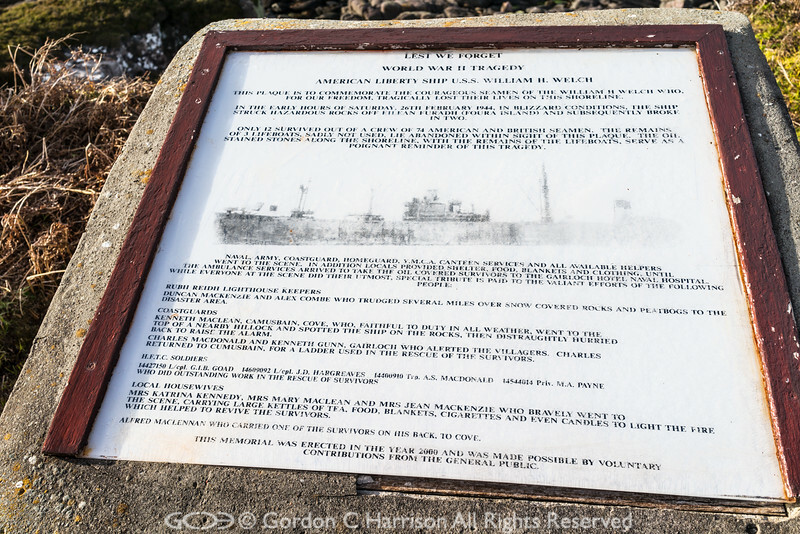 The USS William H Welch memorial is located about 70 metres beyond them on the hillside overlooking the shore. Leaving Camus an Aiseig behind the next bay I reached is Camas Dubh, Black Bay. This is shown in the photograph below and marked as number 3 on the map at the beginning of this story. From Camas Dubh there is a clear track leading inland towards Loch an Draing. This track can be clearly seen above to the upper left of the photo. The view below is of Loch an Draing looking south-east towards the mountains of the great wilderness. Legend has it that the area around Loch an Draing was the haunt of a fairy known as the Gille Dubh, particulary around the forested area near the south end of the loch. I hoped to encounter the Gille Dubh on my walk! I have reproduced below an account of the Gille Dubh as recorded in Gairloch in North-west Ross-shire its Records, Traditions, Inhabitants, and Natural History. This was originally published by John H Dixon in 1886. The best known Gairloch fairy of modern times went by the name of the Gille Dubh of Loch a Druing. His haunts were in the extensive woods that still cluster round the southern end of that loch and extend far up the side of the high ridge to the west of it. There are grassy glades, dense thickets, and rocky fastnesses in these woods, that look just the places for fairies. Loch a Druing is on the North Point, about two miles from Rudha Reidh. The Gille Dubh was so named from the black colour of his hair; his dress, if dress it can be called, was of leaves of trees and green moss. He was seen by many people on many occasions during a period of more than forty years in the latter half of the eighteenth century; he was, in fact, well-known to the people, and was generally regarded as a beneficent fairy. He never spoke to any one except to a little girl named Jessie MacRae, whose home was at Loch a Druing. She was lost in the woods one summer night; the Gille Dubh came to her, treated her with great kindness, and took her safely home again next morning. When Jessie grew up she became the wife of John Mackenzie, tenant of the Loch a Druing farm, and grandfather of James Mackenzie of Kirkton. 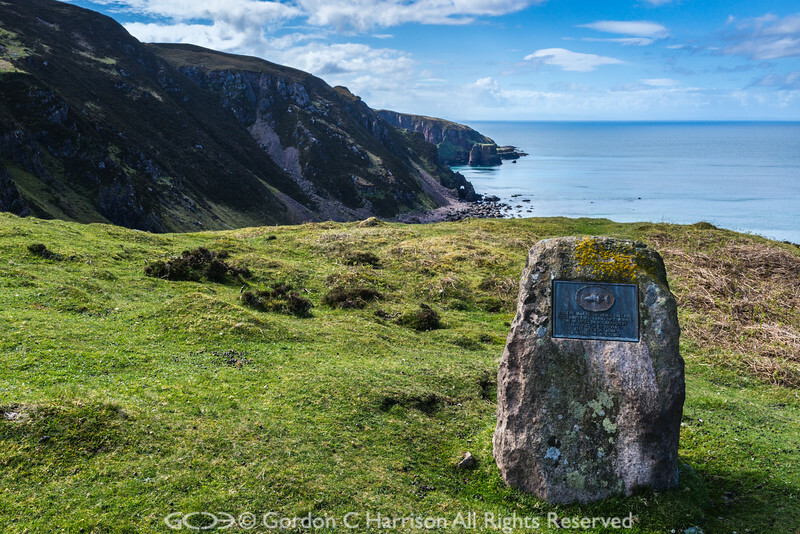 It was after this that Sir Hector Mackenzie of Gairloch invited Sir George S. Mackenzie of Coul, Mr Mackenzie of Dundonnell, Mr Mackenzie of Letterewe, and Mr Mackenzie of Kernsary, to join him in an expedition to repress the Gille Dubh. These five chieftains together repaired to Loch a Druing, armed with guns, with which they hoped to shoot the unoffending fairy. They wore of course their usual Highland dress, and each had his dirk at his side. They were hospitably entertained by John Mackenzie. An ample supper was served in the house; it included both beef and mutton, and each of the chieftains used the knife and fork from the sheath of his own dirk. Knives and forks were not common in Gairloch in those days. They spent the night at Loch a Druing, and slept in John Mackenzie's barn, where couches of heather were prepared for them. They went through all the woods, but they saw nothing of the Gille Dubh. Nor did I, but perhaps you will when you follow this trail.... The description given by Dixon of the wooded areas around the southern end of Loch an Draing as being the sort of area that one might encounter fairies is one that is hard to disagree with. I have explored this area on a previous walk and I would say that walking through these forests is as close to being in an enchanted place as I have ever been. From Loch an Draing it is a short walk to meet the other track leading to Camus Mor. When you do turn right and follow the track as makes its way north-west. Soon you will come to Ivor's Bothy (see point 4 on the map above) as shown in the photo below. This came as a complete surprise to me, I had no idea there was a bothy on this peninsula and went inside to have a look around. It has everything you would expect a bothy to have including sleeping benches, seats, books, candles, a fire, stairs to an upper sleeping platform when downstairs sleeping arrangements become full and much else besides. 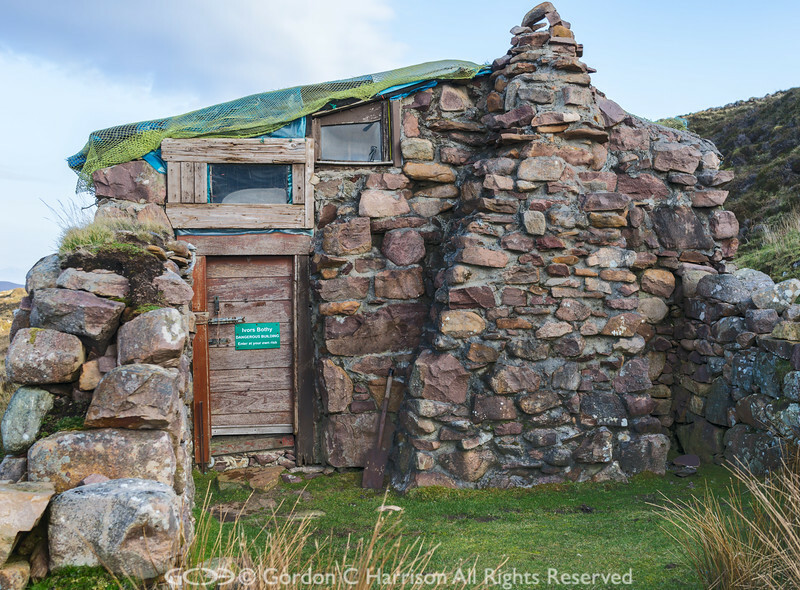 This is a super bothy! It is a short walk from the bothy to the final memorial stone at Camus Mor (see point 5 on the map above), but what a dramatic setting! 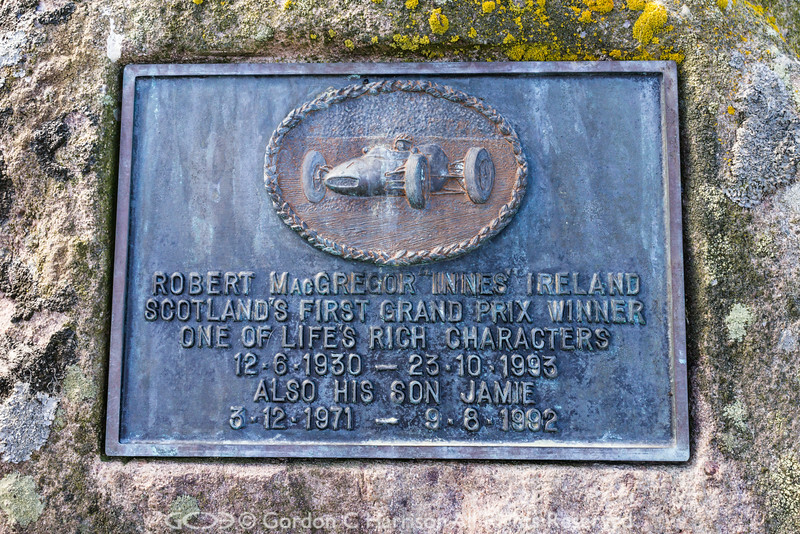 This is the memorial stone at Camus Mor to Robert MacGregor Innes Ireland, Scotland's first Grand Prix winner. The bronze plaque on the Innes Ireland memorial stone was sculpted by Chris Davis, a renowned automotive sculptor using the lost wax method. Innes Ireland became Scotland's first Formula One Grand Prix winner on October 8, 1961 at the event in Watkins Glen, New York. He is reported in various accounts by those who knew him to be a larger than life character, an extrovert, a party animal, hedonist and risk taker. Although Innes Ireland was born in Mytholmroyd, Yorkshire, his parents were Scots and he was raised in Kirkudbright so he was not in doubt as to his nationality. In any event the bronze plaque at Camas Mor now has his nationality sculpted in perpetuity on his memorial. At other times in his life he was an engineer, soldier, garage owner, journalist, author and a trawler captain. It was the latter capacity that brought him to Camas Mor. I can only assume that it was his love of this place that motivated the construction of a memorial to him here. 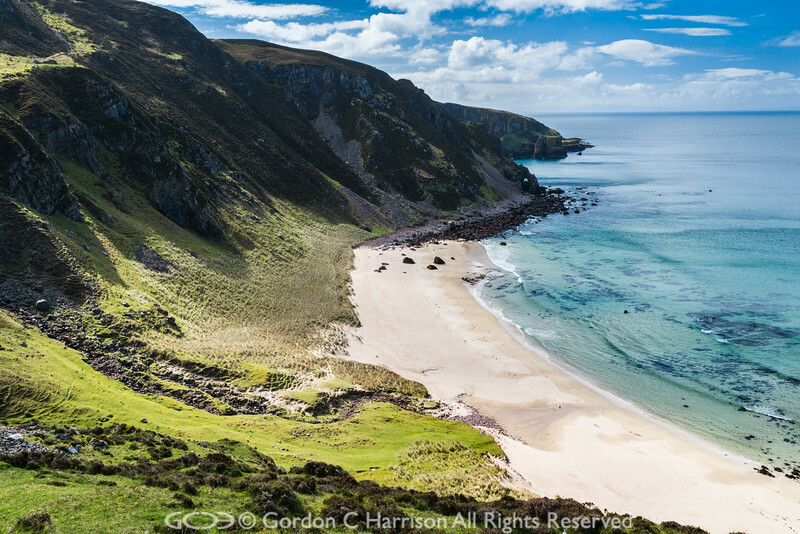 It would be hard not to love such a place as Camas Mor - the big bay - with it's dramatic cliffs, pristine beach and azure waters to enrapture one's senses. Hopefully the photo below captures a little of the feeling of actually being there. Camus Mor is the end of the memorial trail and it only remained for me to make my way back to the start at Rubha nan Sasan. I chose to do this by following the coast all the way instead of returning via the inland track I had used to reach Camus Mor on the way out. At one point the sky clouded over, the light faded somewhat to gave a moody atmosphere to the rugged coast as in the photo below. This was taken looking back to the Camus Mor peninsula. Later however the cloud cleared a little and I was treated to a very pleasant return along the spectacular coast. It had been a long day and I was feeling nicely tired by the time I reached my car at Rubha nan Sasan. 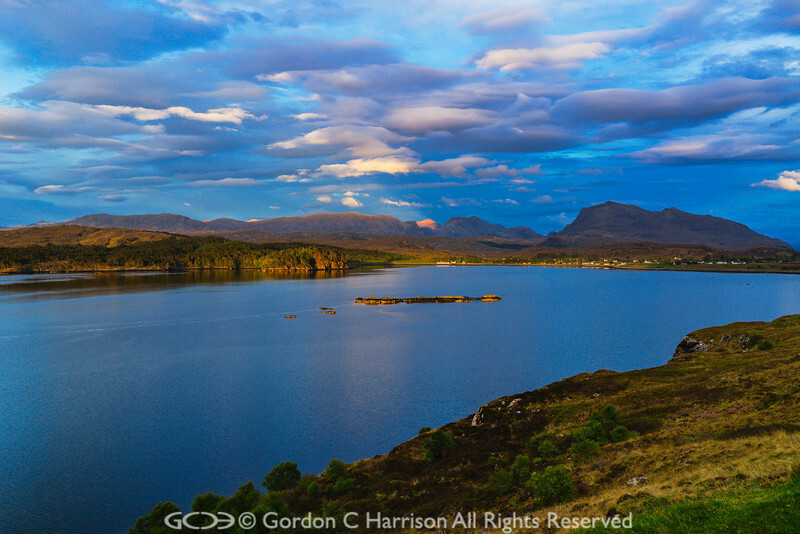 That would have been just after 8pm and as I drove down the shore of Loch Ewe I watched a beautiful sky develop over the loch and the mountains beyond to the east. The sun was setting behind me and would soon drop below the hills throwing much of the scene below into gloom. Abandoning the car I sought with mounting nervous excitement some sort of foreground interest for the scene and after rejecting several candidates decided I had better make up my mind pretty damned quick before the light died! The shot below was the result. I went home contented having enjoyed a wonderful day in beautiful surroundings in an area full of history and legend. For those interested in reading more about the topics I have touched on in this story I have given links to further reading below this final photo. Website of the Russian Arctic Convoy Museum Project. They have an online shop selling a range of products including books about the history of the Russian Arctic convoys. Book (on-line); Gairloch in North-west Ross-shire its Records, Traditions, Inhabitants, and Natural History. This was originally published by John H Dixon in 1886. Second hand copies of the original are still available from second hand book dealers. A modern reproduction is available from the Gairloch Heritage Museum.